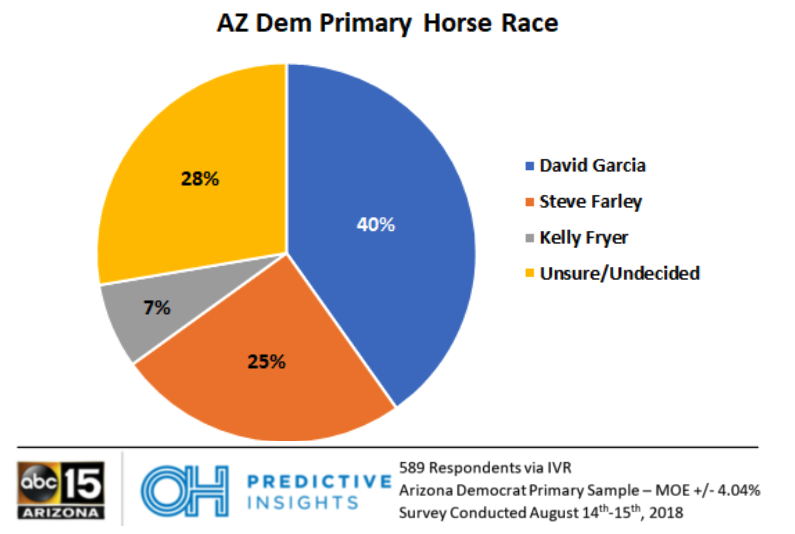 PHOENIX (August 21, 2018) – A new poll from OH Predictive Insights shows that David Garcia has a 15-point lead over his nearest rival, State Senator Steve Farley, in the Arizona Democratic primary race for Governor. 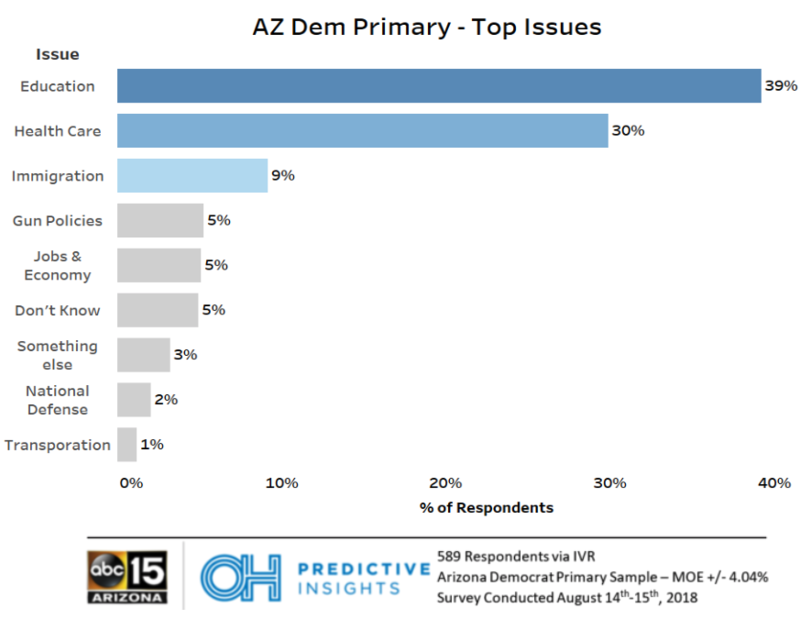 OH Predictive Insights and ABC15 Arizona (OHPI/ABC15) teamed up to find out who is currently winning the Democratic primary for Governor. David Garcia currently holds 40% of the primary vote, Steve Farley holds 25% and Kelly Fryer has 7%, with 28% still undecided. Garcia is outperforming his fellow Democratic opponents in three key demographic groups: gender, region and political ideology. Compared to his closest rival, Steve Farley, Garcia holds a 17-point advantage over woman, 24-point advantage in Maricopa County and 25-point advantage among self-identified liberals. There is one bright spot for Farley: He is out performing Garcia in Pima County by 14 points. Of those surveyed, 46% said they have already mailed back their early ballot, 34% have not mailed in their early ballot although plan on sending it in, 19% plan to vote at the polls, and roughly 1% did not know. President Donald Trump’s job approval was not much of a surprise given the target audience. Roughly 9 out of every 10 respondents disapproved of the job Trump is doing. Methodology: This IVR telephone survey was completed by OH Predictive Insights in partnership with ABC15-Phoenix (OHPI/ABC15) on August 14 and 15, 2018, from a likely Arizona 2018 Democratic Primary voter sample. The sample demographics accurately reflected party affiliation, geographic location, gender, and age. 90% of respondents were Democrats and 10% were Independent voters. 100% of respondents were completed via landline. The sample size was 589 completed surveys, with a MoE of +/- 4.04%.